Summary: The film’s pleasures, and consistent strong laughs, far outweigh these problems. It’s been seven years since Ben Stiller’s Zoolander set a new standard for really silly cinema, and between then and now alleged ‘spoofs’ like Epic Movie have swiftly dragged this once respectable genre, spawned by the classic Airplane, right down the toilet. Thank goodness then that Stiller’s climbed back in the director’s chair, armed with a good script and a great cast, and delivered one of the best comedies of the year. Tropic Thunder is ostensibly about the making of a Vietnam War movie, but it’s not war films that are primarily being spoofed here. It’s the business of making movies, and the endless ego and ridiculous pretension that comes with the territory, that is Stiller’s main target. As in John Landis’ 80s hit Three Amigos, Stiller has the pampered A-listers stumble unwittingly into a real-life conflict (over drugs) while filming, and fail to realise the danger around them, assuming it’s all part of the movie. 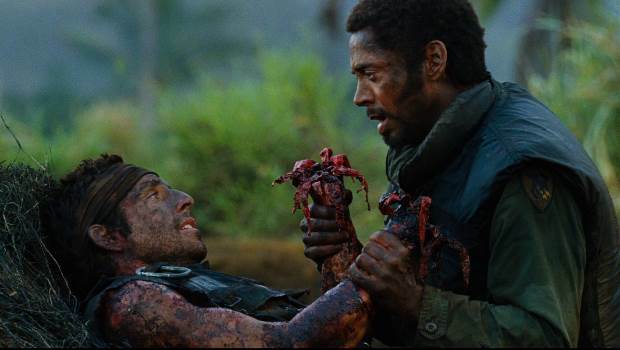 The first thing that hits you about Tropic Thunder – after a brace of hilarious spoof trailers that succinctly introduce the main characters – is the enormity of Stiller’s canvas; the film is clearly a comedy, but its scenario is created and shot with the kind of attention to detail and cinematic expertise normally reserved for more ‘serious’ fare. Swooping cameras take in expansive jungle vistas, soaring helicopters and enormous explosions, and it’s clear that the director is playing with his biggest budget ever. It’s thrilling to see such high quality production values in what is essentially a very silly film, and all credit to Stiller for having the gall to ask a studio to put more than usual of the billions they rake in from cheap comedies back into the same genre. Come to mention it, Ben Stiller seems to have a knack for getting whatever he asks for, judging by the incredible cast he’s assembled here, including a Zoolander-rivalling level of star cameos and better-than-they’ve-been-in-ages turns from Matthew McConaughey and a scarily made-up Tom Cruise. Top of the pile by a country mile though is Robert Downey Jr. as Kirk Lazarus, an Oscar-winning Australian actor so consumed with himself and his ‘art’ that he is totally unaware of what is so wrong about him blacking up to play an African-American soldier. Downey commits to the performance completely and plays the character without a hint of slapstick, causing material that could have been offensive to be totally hilarious, as Lazarus is unquestionably an idiot. Like all the best comedy characters, Lazarus is such an excellent creation because he’s only a very slight exaggeration of reality. When he says “I don’t step out of character until I’ve recorded the DVD commentary” it’s funny because it’s just the kind of thing we’ve heard countless times from the likes of Russell Crowe or even Downey Jr. himself in more self-important moments. This is the sharp end of Stiller and co-writers Justin Theroux and Etan Cohen’s script, and while it isn’t all up to this standard, the writing generally favours this kind of satire over broad slapstick, which is commendable in such a big-budget production. There are weaknesses to the film; initially it seems that such large-scale filmmaking may be beyond Stiller’s abilities, with early scenes feeling a little disjointed and his storytelling not skillful enough to hide some awkward plot turns getting the characters into the ‘real battle’ scenario. Jack Black’s junkie actor character is also somewhat wasted (no pun intended), not getting any decent gags until the final third of the film, and with less of an apparent parody angle than the other main characters. But the film’s pleasures, and consistent strong laughs, far outweigh these problems, and will leave audiences hoping they won’t have to wait another seven years before Stiller gets behind the camera again.